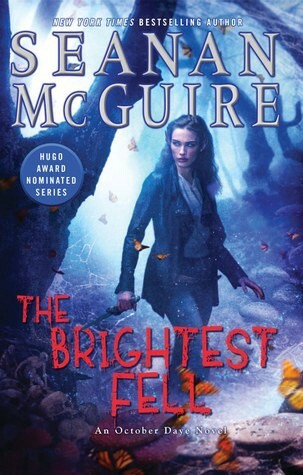 ‘The Brightest Fell’ is written by Seanan McGuire. It is the eleventh book in the ‘October Daye’ series. Amandine, October’s mother, lands up on her doorstep and demands that she find August, October’s Sister. Being a first born, Amandine the Liar, has the attitude and powers to take Toby’s friends hostages to force her to do as she wishes. I strongly recommend ‘The Brightest Fell’ to fantasy readers. If you are familiar with the series, then this book is going to blow your socks away since it brings freshness back into the series. If you are new to the series, you will still enjoy the book though reading the series in order will make this enjoyment better. Long running series have the danger of falling into a rut — case in the point Jane Yellowrock (read my review of Cold Reign here). Authors tend to repeat a successful formula or get into a deep hole that they find themselves unable to climb out of (*cough* Dresden Files *cough*) . But, Seanan McGuire has pulled off a zinger here. This book is gripping and I had to finish it in one sitting. I found the theme of this book to be interesting and innovative. Seanan McGuire has focused on the unintended and thoughtless consequences of a hero’s journey here. She brings together threads from past to show us how it is easy to stop caring and fall into a trap of focusing only on the end without worrying about the means. This series has had it ups and downs. But it is now back on track. I knew Simon Torquil would end up sacrificing himself for his daughter. But I was surprised by the decision to make him go back to his villainous ways. While I can understand the need for this — October Daye needs her Moriarity equivalent after all — it felt like a cop out to me. I liked the ending too. It was realistic in that the trauma of being hostages does not magically disappear.